Chevy and GMC Duramax Diesel Forum > Specialty Forums > Towing & Hauling > Opinion please: Would airbags be helpful? Opinion please: Would airbags be helpful? I am trying to figure out if I need load leveling airbags for my truck. I am attaching a picture of my fully loaded truck and trailer. The truck has a little bit of squat to it. I have pretty good tension on the equalizer hitch bars in this shot. Driveability seems fine. We mainly do short runs of 400-500 miles round trip to ride. However, we will be going on a 2500 mile 1 month camping trip to the desert SW though and I don’t know if airbags would be necessary or helpful. GCVW is about 18k fully loaded. 2006 Chevy CCSB 2500HD Duramax 4wd. Coach has appx 900 lbs hitch weight unloaded. 110 gallons of fresh water over the axles and most of the weight of the bikes are over or behind the axles. For the upcoming 2500 mile trip we will not be taking the bikes (1500 ish pounds) and will run the fresh water (1000 ish lbs) low to travel as we will be doing full hookup sites. Location: Not in Boise but nearby. Air bags are a good thing for leveling a truck with a load. If I had your situation it is probably what I would do. One problem air bags have is that they are excessively progressive in their spring rate. That is, they don't add much lift for the first inch or two when compressed but they add a heck of a lot of lift in the last inch or two. This means that as they cope with road irregularities they are kind of floaty at first and then get harsh near the end of travel. Some people really like this because it gives a nice smooth ride when going down the highway but at the expense of harshness on rougher back roads. Newer designs are better at this and having airbags specifically sized for your application is also helpful. Also, if the air bag is too tall it will have nearly the same lifting force over its entire travel which also makes for a smooth ride but then for a big bump as the suspension bottoms out. If you do air bags be sure to get ones that are well matched to your truck. Airbags will increase the spring rate of your suspension even if they are nearly empty. The shocks need to match the spring rate for proper control. If the springs are carrying more load but the shocks are the same the suspension will become bouncy, like luxury cars of the 1960s. If you go with air bags you need a kit with matched shocks too. 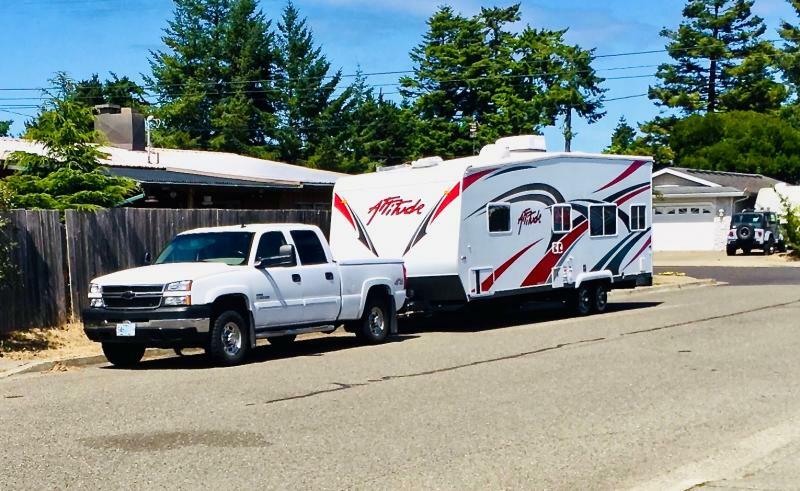 For a bumper pull trailer there isn't as much tendency to roll as there would be with a camper, say. With a camper it is also important to match the sway bar to the use. With a bumper pull trailer it isn't needed so much but if you can come up with a bit beefier sway bar and stay with in budget then it would be a good idea. I cant recommend air-bags ( or the less expensive near-equal air shocks) highly enough. In my own case, was faced with an unacceptably rough ride when un-loaded, so had a shop remove one leaf from each side of the rear leaf-spring "pack'. result - SMOOTHER ride and dramatically reduced that absurd "forward rake" when empty. Air bags (or, again, the cheaper solution = air shocks ) restored a level "riding height" even with the approx. 1,000 lb. "tounge load" of my trailers. Suggestion - I used a "T" to join the air lines together, then connected them to a "Schrader valve" in an accessible location ( in my case, the rear bumper) so I can easily add (or reduce) air pressure when necessary to restore a level riding height regardless of load. Check out Tork Lift Stable Loads for your truck. On a 2500 the lower Stable Loads engage a wedge between your lower overload spring and main spring pack, it will level your ride out while using your factory suspension. They can be engaged and disengaged in a minute when not needed. For me the best part was that you do not get the airbag bouncy ride and saved $$$. …….Stable Loads engage a wedge between your lower overload spring and main spring pack, it will level your ride out while using your factory suspension. They can be engaged and disengaged in a minute when not needed. For me the best part was that you do not get the airbag bouncy ride and saved $$$. I disagree - sounds to me like this "Stable Loads" deal would, by definition, make the rear spring assembly stiffer. Sure that would help with over-loads, but who wants an even stiffer riding truck ? A "airbag bouncy ride" ? Well...a "bouncy" ride, with or without airbags, is a sign of bad shock-absorbers. With decent shock-absorbers restraining the re-bound, our suspensions are not going to give a "bouncy" ride, air-bags or not. No question - an air bag kit from the "majors" is going to be expensive - approaching the four hundred dollar range, plus time-consuming labor to set it up. A less expensive & admittedly less competent (but still satisfactory for my own needs - I don't overload my truck - my two trailers each have only about a 1,000 lb. tounge load ) would be air shocks. Paid about a hundred bucks for the pair - simple "in and out" installation (true..some time lost "stringing" the air lines and installing a Schrader valve) but wound up with both the ability to control how the truck rides, AND got new shock absorbers ! That is important. With weight on the bumper hitch it will tend to lift the front wheels by leaver action. If you can transfer some of it with an equalizing hitch it will make a difference in the way the truck drives. However, our trucks are already front heavy. The hitch doesn't have to completely compensate for the added weight at the bumper, just enough to keep it balanced. It sounds like your setup does about that. TorkLift StableLoads is an interesting idea but it takes more effort to enable and disable than an air bag. Ultimately you would probably windup just leaving them on or off. One thing about air bags is that you can adjust them on the fly if you just set up a compressor and valves. That can be a really handy setup. If you have a steep escape angle that would drag the rear of the trailer you can let the air bags down which would lift the rear of the trailer. If the trailer needs a little leveling when parked up you could do it with air instead of having to jack it so much. Being able to adjust the setup of your truck and trailer from the cab can be an outing saver. I wouldn't use a t valve because it would let air bleed from one bag to the other, allowing the truck to lean gradually toward the down hill side. Not a deadly situation but not ideal either. I think I would rather have independent systems where I could actually lean the truck up hill if I wanted to. Last edited by mizterwizard; 03-13-2019 at 09:17 PM. Thanks for the replies everybody. While researching the torklift product I came across these. Any opinions? Opinion: better than nothing, not as good as air bags or TorkLift. Heck I don’t even need my over load 3500 helper springs with air bags. I got a deal,on airlift but firestone has a way better warranty. Go to first new post Total Injector Failure??? Today 06:01 PM by Hook'em_Horns!